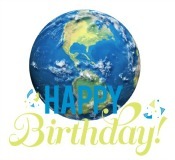 Happy 45th birthday, Earth Day! Bring out the cake, candles and gifts, because it’s time to celebrate! On April 22, 1970, Earth Day served as a “symbol of environmental responsibility and stewardship,” according to then U.S. Senator, Gaylord Nelson. Forty-five years later, as society has evolved through technology, environmental sustainability and as a byproduct, environmental responsibility, is taking strides to protect the one Earth we have is necessary now more than ever. One step towards environmental responsibility is modernizing the aging electrical grid. One may ask the question: How can a smarter grid improve some of the current environmental issues facing the nation? Well, a smarter grid reduces greenhouse gas emissions by making it easier to connect renewable energy sources to the electricity grid. Having the ability to easily connect to renewable energy sources is the first large step towards not only sustainability, but also energy independence. Also, smart energy technology and programs empower electricity customers to save money and be more energy efficient than ever before. For example, research illustrates that when customers know how much energy they’re using, they will reduce their overall electricity usage by 5 to 10 percent. By taking meaningful and smarter steps toward modernizing the nation’s 100-year-old electrical grid, Americans can unite and continue the stride towards environmental stewardship to the Earth. Earth Day continues to serve as a reminder of our responsibility to ensure it is useable for future generations and years to come.